The whole world seems to be talking about breastfeeding, whether we are discussing where women should nurse in public, or demanding that facebook and instagram #freethenipple, there's plenty of controversy and stigma attached to something which in essence is really simple. When I say simple, its simple as in pushing a boulder up hill is simple (to paraphrase Lauren Laverne). It can be draining both physically and more often mentally when first getting started. We lack any consistent network of support in the UK, and here, our rate of breastfeeding success is dropping. Consequently, the biggest topic of discussion seems to be whether or not breastfeeding is actually beneficial at all. Since becoming a mum, I've seen so many articles in national papers discussing this (I've even been in one) 90% of the time these articles are written by mums who chose not to continue breastfeeding in the early days. Many of these articles quote recent Harvard research undertaken on siblings ( one formula fed and one bottle fed) which indicates that there is not significant enough research to suggest there are any identifiable benefits to being the breastfed sibling. Which is a problem, because as I discuss below the research paper and it's conclusion are inaccurate. 2. The comparisons were based on long term benefits of children aged four and over- why are they excluding the early years from comparison? Did they find something against their hypothesis? 3.The research document is ridiculously vague on what they term “breastfeeding” for the comparison of siblings. It could be used to call breastfeeding as colostrum only feeding. Whilst colostrum only feeding has many kick start immunological benefits I wouldn’t expect it to have long turn benefits. 4 This is ONE piece of research. I can also show you countless pieces of research that contradict this study. Including two unicef manifestos on infant health. 5. Breastfeeding is as nature intended .Formula comes in a tin and needs to be boiled to kill off is bad bacterial contents . 6. Breastfeeding is beneficial to mum. This again is something your lovely post failed to mention. It’s proven to dramatically your risk of ovarian and breast cancer as well as reduce PND. 9. Parents of breastfed babies on average get 40 minutes more sleep an evening- you will want this. I feel that using this study to underpin a feature that is 'intended to reassure mothers who couldn't breastfeed' actually has a dramatic impact on expectations of breastfeeding. Don't put faith in sure start employees or health visitors. They are woefully ill equipped to support you. Mayim Bialik is quickly becoming my parenting hero. I think it's great that she is helping normalise attachment parenting and RIE into the mainstream. Our culture has been in need of a public figure who openly discusses how important the choices we make as parents are. I love the fact she's so open about breastfeeding too. I'm not sure why we're afraid to talk about breast feeding, but it's wrong. Breastfeeding needs to be discussed (and practiced) in public in order to normalise it for the next generation. "Forcing (even gently) children to kiss people they don’t want to indicates to children that they don’t know their own sense of safety, comfort, their bodies, and what to do with them. Period. I know I’m overly cerebral. I know I think too much and I know that Attachment Parenting people like me are accused of giving our children too much of a voice, but you know what? I’ve seen this done a lot of ways and I like my kids having a voice. And I wouldn’t trade one over-thought moment with my children for anything, because they always tell me exactly what they need and I then get to handle it. If for whatever reason my children don’t feel like being physically affectionate, I honor that. Period." It's a nice article and true. Our kids need to be comfortable enough to express their emotions clearly whether or not it conforms to the expectations of others, and it is our job as parents to offer them support when they feel they are being pressurised to do something against their instincts. In the post I address some of the questions/arguments people have about cloth nappies and show how much I saved by using them. Buying cloth nappies is expensive to start. Hmm no. Not really. Most expectant mums I know by a couple of boxes of pampers before their baby is born. It's part of the nesting impulse to be ready. These boxes aren't cheap at £26 a pop one box will last roughly a week. I recommend by a small second hand stash of about 20/30 nappies. With a variety of brands so you get an idea of what works for you. I budgeted around £70 for my set up stash and got about 40 nappies. That wouldn't even pay for three boxes of pampers. A lot of council offer vouchers for reusable nappies too as a thank you for helping reduce waste. Don't you need more kit with cloth nappies? I was overwhelmed by nappy pails, disposable liners, nappy soak, reusable liners, wraps, reusable wipes and inserts too. The basics of cloth are simple- you have a nappy to absorb the wee, an outer or wrap to stop the nappy making the babies clothes damp, and a liner which goes between the babies skin and the nappy to stop the baby getting damp/sore as it wicks the moisture away and locks it in the nappy. If your baby wees a lot at once then inserts provide extra absorbancy ( also handy at night for longer dryness). Dirty nappies go in a pail ready to be washed. Disposable liners- you don't need these till your baby is weaned really (for breastfed babies) as until then their poo is runny and wet like curry sauce and just washes away the same as any other liquid. Disposable liners are either flushable of binable. And are convenient when things get a bit more firm. They can cause skin irritation in some babies. You can also shake and flick the solid contents off a washable liner. Once a baby gets into a routine you can predict a bowl movement and put the disposable liner in anticipation. Most cloth nappy mums use a mix of liners. Note pocket or all in one nappies have a polyester fleece top to skinside which acts as a liner. 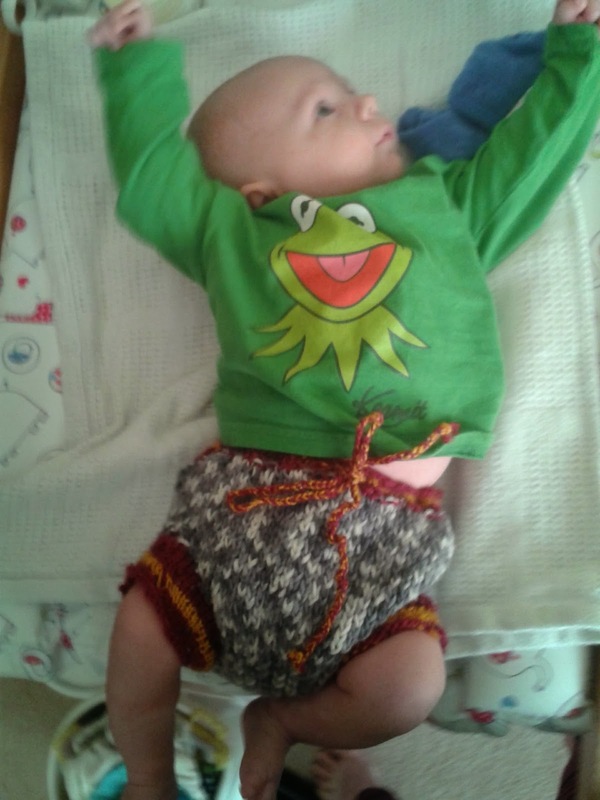 My son is nearly six months old and I'm yet to soak my nappies. I dry pail, which to put simply means I put the dirty nappies in the pail and wash them when needed. In my washing machine with normal washing powder on 40 degrees. Some nappies have got stains, which could be removed by soaking in a stain remover or nappy bright or blueing. I will probably do this before storing them , but while he's using them I can't see much point. To start with no. You will be changing nappies every 3/4 hours with tiny babies. As they get bigger boosters or inserts are a handy way of getting more milage out of a nappy. Inserts can either be put between the nappy and the liner. Or stuffed into a pocket nappy. Microfibre- cheap and quick to wash but not super absorbant. Can cause nappy rash. Bamboo- very breathable but not as absorbant as Terry. Trifold/prefolds- are technically nappies in their own right. For this reason they are really absorbant. They aren't as cheap and some people find them confusing. Some nappies (mainly American brands and less common in the UK) will have pop in liners of multiple layers that are fleece side up and cotton/Terry side down. These are absorbant and reduce the need for a separate liner, but in my experience not so good as other nappies as the dampness stays in one spot. How many wraps do I need. No more than 1 to every four nappies. You can reuse them off not soiled for multiple nappy changes and when washed they dry quickly. You don't need to buy the same brand of wrap as nappy. The only wrap I've had problems with is the tots bots because the Velcro doesn't hold the whole waist band. You can also buy or knit soakers or longies which are made of wool. They do the same job and make nappy changes fast. They will need lanolising to retain the water repellent properties. Pocket nappies have a wrap outer already as part of the design. How do you know what brand to buy? I bought a selection of different brands as I saw mixed reviews for all. 6 trifold bambino mio inserts (these make great stuffing for pocket nappies too) with bambino mio outer nappy shells (which work as wraps for first size nappies). These were great for the early days as I could more often than not just change the trifold. 12 tots bots nappies. These have sewn in boosters . Some have sewn in liners. I really didn't like these to start with. They are very expensive even second hand. They take a long time to dry which is annoying when you have a baby going through 14 nappies a day and they are still wet when you need them. Now I'm changing half the amount of nappies I appreciate their absorbancy, ease of use and fit more. These are fab for newborns. The fit is nice they are breathable you can stuff them to make more absorbant if you need too. I was also given some cheeky monkeys by a friend these have popper in insert/liner. They are also great for young babies but not so common in the UK. I didn't use them but an option is the old fashioned Terry nappies. These are folded in half to a triangle and fastened with nappy pins or nappy nippers. They are really cheap to buy new. A bit more fuss to put on and can leak so are best use with a wrap with a leg gusset. 2 All in One-great for being out and about and very reasonable. The sites selling these claim they are birth to potty. I like them a lot but until my boy weighed 13lbs he occasionally leaked out of the leg. I've just upped my stash to 10 of these in preparation for when he grows out of his size ones at 19lb. Little lambs- I love these. I really recommend them. They are such good value. Their pocket nappies are good, but is their standard nappies I love. They are absorbant and fit really well. Like the tots bots they need a while to dry. But the price is brilliant at £4 each. What about the cost/amount of washing. Since our son was born we've been washing an extra 3/4 loads a week. This includes his clothing/ bedding changes. 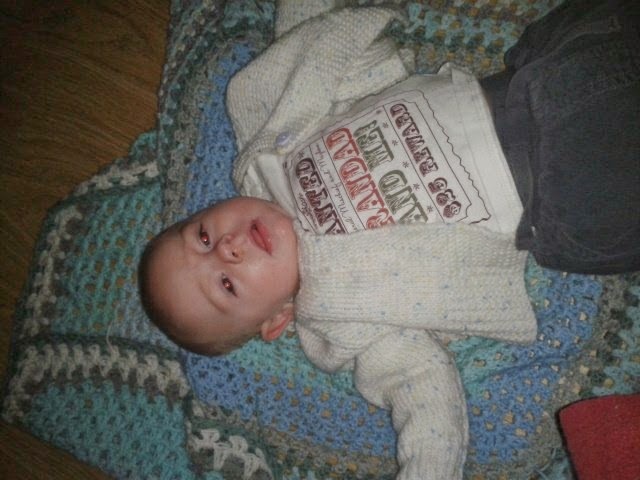 He suffers with reflux so this adds to the load. The cost of running the machine for these loads works out about £1 a week in electricity. I make my own laundry powder which costs 3p a load. 80% of the time I dry my nappies on the line/radiators so I spend around 50p a week using the tumble dryer. Cloth nappies are easier on the go than you might think. You can buy dirty bags to store used nappies most hold 3/4 soiled nappies without smelling. These wet bags are handy for mucky clothes too. It also removes the need to track down baby change bins whilst on the move. Compared to pampers I save at least £15 a week. The planet. Disposable nappies go into landfills. We have no idea how long it takes to decompose. We have to get real about the rubbish sooner or later. You will also be using at least 50 nappies a week. That's more than enough to fill a regular council bin on their own. And boy do three day old nappies stink. Babies skin- my son has barely had nappy rash and we rarely use nappy cream or bottom balm. Buy for one use for all- once you've bought nappies there yours for ever. My mums stash has seen her through three babies and two grand babies. Less shopping - great for confirmed pedestrians like me. They are so much nicer looking and feeling than disposables. You don't have to worry about running out. It's easy to tell if the nappy needs changing. If you are going to wash nappies you might as well wash wipes too. They are much kinder to babies skin and more effective. I will post a blog about these son. When I had my son I was desperate to find as many greener and less chemical ways to run our home as possible. 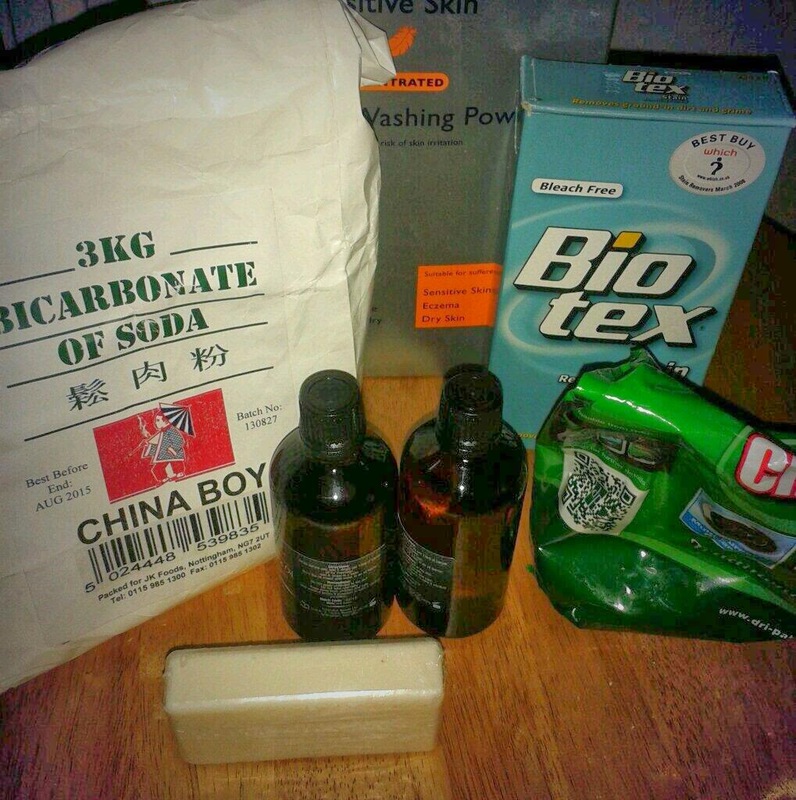 Washing Powder was on top on my list to make at home for a few reasons. Firstly we use cloth nappies and I wanted to reduce the cost per wash, secondly because I'm trying to save the equivalent of a salary by being a stay at home mum, and finally I don't drive and prefer to wear little frog rather than take the pushchair when we do the shopping so wanted reduce the volume of stuff I was having to heave home. I found some great ideas online, but found that the washing liquid recipes required more space than my bedsit sized kitchen could offer and that most of the powder contained borax which is a dangerous chemical not readily available in the UK. Total Cost £1.43- Makes Approx 50 washes - Cost per wash - less than 3p! Or 10% of the cost of Ariel. 3.Add the drops of essential oil whilst stirring. And you are done! I use two milk bottle caps full per load (6kg machine) and have had no problems at all with my nappies or clothes. I wash on 40 degrees and get around 50 washes per batch. As someone who recently removed all active toys from their home but who's child is an only grandchild to an enthusiast mother in law I had to share this.
" Dear Grandma, if you still feel you want to buy something special for that wonderful grandchild, here are some suggestions for play objects that she will use more as she becomes a little older. As I mentioned, wooden toys are fine for one child to use at home. Many toy stores carry beautiful wooden blocks and lovely wooden puzzles of simple shapes with knobs for little fingers to lift each piece. Some Montessori materials such as wooden cylinder sets in their own trays make fine gifts. And of course it is a grandparent's prerogative to give a favorite doll to any grandchild. (Naturally a favorite doll would be a safe doll, with no small, removable parts. 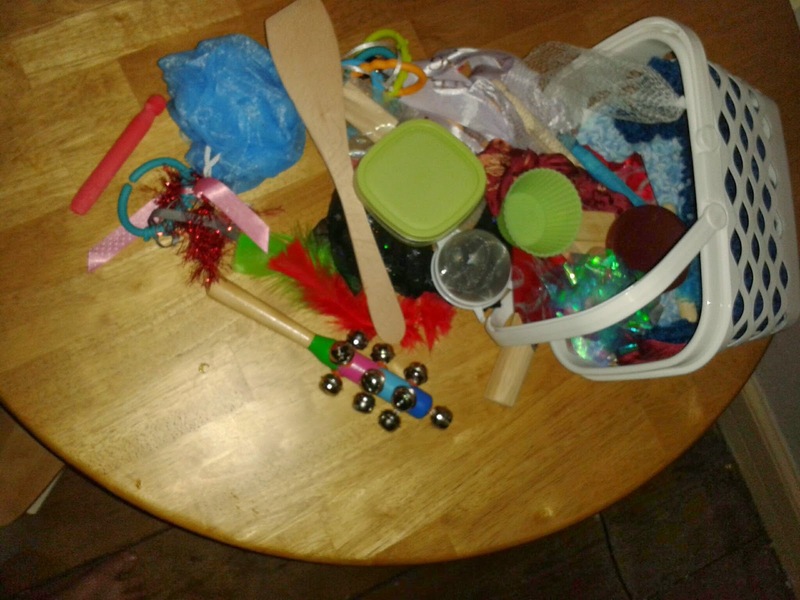 )What do all of these recommended play objects have in common? None do anything. They will only respond when the infant activates them. In other words our active infant manipulates passive objects. In contrast entertaining kinds of toys, such as mobiles or later on windup toys, cause a passive infant to watch an active toy. This trains the child to expect to be amused and entertained, and sets the scene for later TV watching.The best materials for infants need not be fancy, but neither are they limited to castoffs. The best play objects for babies are those which allow them to be as active .and competent as possible at every stage of development." As a country we are failing an awful lot of kids. Our literacy and numeracy rates are plummeting. Whilst test scores are going up. The state of the educational system as a whole is a mess. GCSE's were set up to be an illustration to employers of a persons ability to apply themselves, yet more and more companies are losing faith in secondary education to a point where degrees have become the entry level academic requirement for previously no academic job roles. This video (although discusses the USA educational system) is applicable also the UK. If this video interests you I really recommend you check out this book on how our school system is failing one in five kids. The book briefly discusses in the fifth chapter something I have long known, that actually parents have the greatest impact in their child's future. Something that I personally believe could be remedied by increasing the amount of mothers who stay at home with their children in the early preschool years. This a point which I'm looking forward to discussing further in a future blog. These kids are seemingly labelled as faulty products and forgotten. Whilst schools take hand outs for them. Back in the 80s a child psychologist named Elinor Goldshmeid first used the term Heuristic play. 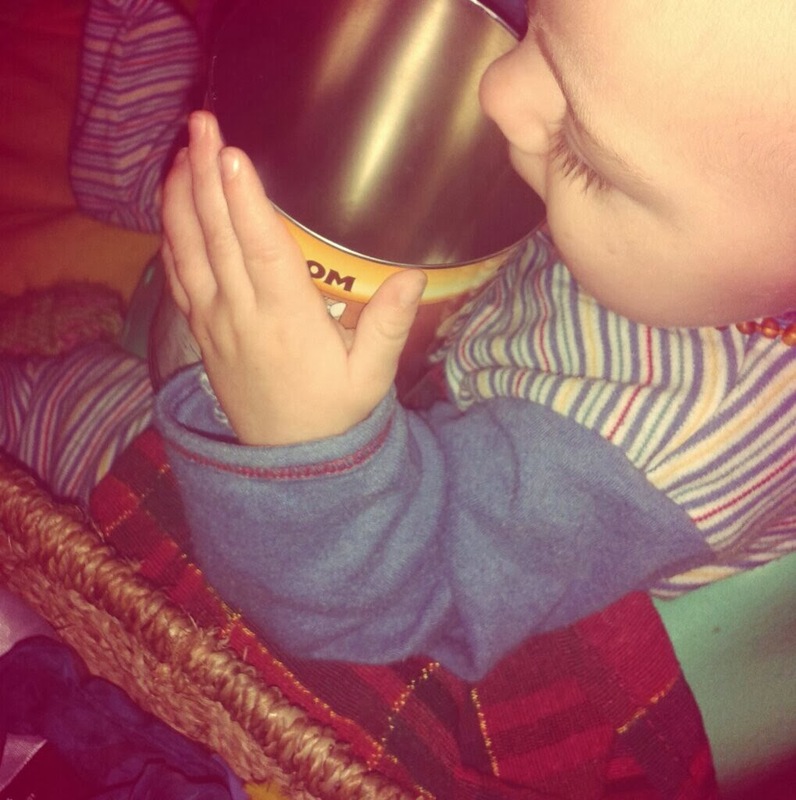 Heuristic play refers to the interaction of babies with everyday objects. 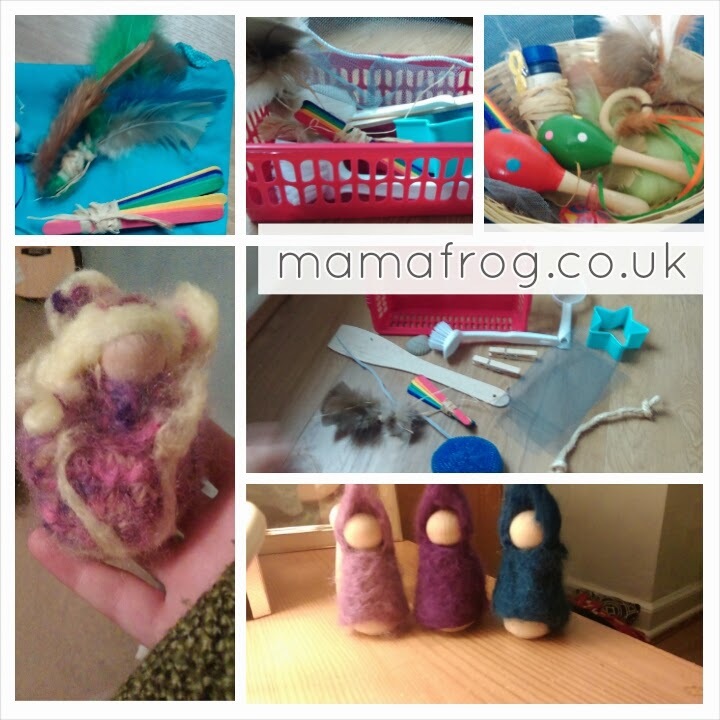 This play has been shown to actively improve a child's development skills in areas such as problem solving, it stimulates all of the babies senses and kick starts creative play.